As superyacht brands go, the Feadship name has long been synonymous with quality, excellence and meticulous attention to detail. To own a new Feadship yacht may be a badge of prestige, but to own a classic Feadship is to have a piece of superyacht history. Each has its own story and a share in the DNA that has made Feadship what it is today. Feadship itself started off as an export association (the name Feadship is derived from First Export Association of Dutch Shipbuilders) although its boat-building credentials stretch back into the 19th century through its early member yards, among them de Vries and van Lent. Its stated goal was ‘to promote the export of luxury craft to the United States of America’, and up until 1973 a ‘Feadship’ was still defined as a yacht sold to an American owner. The year was 1949 and post-war Europe had little appetite for luxury yachts, so this group of far-sighted Dutch builders – and naval architect HW de Voogt – looked to America for salvation. Feadship introduced itself to America at the New York Boat Show in 1951 with just three small boats, but managed to impress with its ‘traditional Dutch craftsmanship’. Americans were amazed by their yachts’ quality and finish, and the fact that they were made of steel (almost unheard of in America at that time) – but it was Feadship’s ability and willingness to react to the demands of the American market that was pivotal to its success. Built for Dieter Holterbosch, owner of the Brewers Leasing Corporation, Prosit was originally commissioned in 1965, but it took almost two years to nail down the contract because of the owner’s specific demands resulting in frequent changes to the specifications. 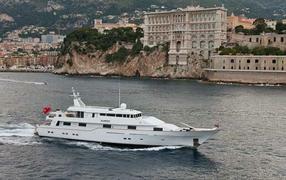 The party on the occasion of her launch has gone down in the annals of Feadship history. It was by no means all plain sailing, however, as the Dutch entity grappled with such problems as American reluctance to order yachts on paper, the adaptations necessary to suit American requirements and tastes – different voltage and even light bulbs were needed, and large, state-of-the-art galleys and sumptuous bathrooms were expected, the effects of heat and humidity on its yachts in places such as Florida and the vagaries of the economy. But Feadship worked hard on solutions and the yachts that emerged were acclaimed as masterpieces of quality and distinction. Almost uniquely, Feadship offered yachts that were completely custom designed and built for their owners. 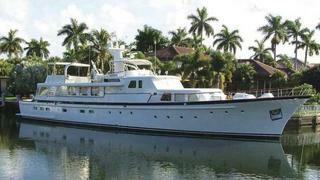 This period saw the emergence of the Feadship custom superyacht as larger and larger yachts were commissioned by ever more prestigious clients – among them Malcolm Forbes, president of Forbes Magazine, whose 1957 steel-hulled motor cruiser The Highlander is credited with seducing Henry Ford II into commissioning Santa Maria. Ordered by the Forbes family for corporate use, Highlander was successor to a long line of yachts of the same name – most of which have been Feadships. 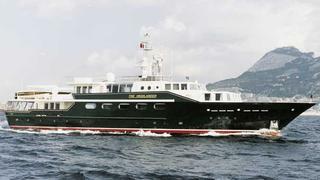 The outstanding lines of her superstructure and her semi-cruising stern were created by Jon Bannenberg, and the yacht’s exterior is uniquely green – the colour of money, and a reference to the yacht’s staunchly capitalist role. Above all, it represented the ultimate customisation with the implicit declaration that this was a Forbes yacht as much as it was a Feadship. Meanwhile, Europe was recovering and a spate of major commissions started coming in from European and Middle Eastern clients, boosting Feadship’s fortunes and expanding its customer base globally. Collaborations with Carlo Riva, owner of the ultramodern Cantieri Riva, gave Feadship important experience in the benefits of fine detailing and the potential hazards of over-elaboration and resulted in three different De Voogt/Riva design series, and the Italian connection led to important commissions in Italy, one of which was Monara II. 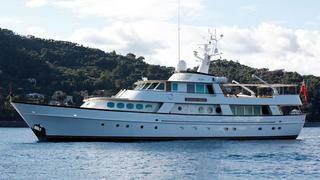 Launched as Monara II, Olympia was one of two Italian commissions Feadship received in 1969, both for 25.8 metre yachts. As the concept of a superyacht evolved through the 1970s, Feadship had to take on board a new challenge in the form of the professional interior designer. Up until then interior architecture and decoration had largely been an in-house affair, but owners started employing their own interior decorators and the specialist trade in yacht interior design was pioneered by Pierre Tanter in Lac II. Initially this caused difficulties as drawings had to be constantly changed following designer consultations with owners, but Feadship learnt valuable lessons working with many talented designers, among them Diana Yacht Design, responsible for Karina C.
Another motor yacht from the de Vries yard, C Side was launched as Karina C. Her original Diana Yacht Design interior was replaced by a Michael Kirschtein one when she was refitted in 2010. Jon Bannenberg was to shake things up even more when he came on the scene because his work involved not only interior design but also exterior styling. This signalled a whole new way of thinking at Feadship for restyling had profound effects on stability, weight, balance and performance. Working together with open minds, difficulties were overcome and the exceptional results of this co-operation include yachts such as My Gail II, Azteca and Paraiso. An ocean-going displacement yacht Branzino_ started life as _My Gail II, and was built by de Vries to a Jon Bannenberg design for Gerald Ronson. Among the most notable changes introduced by the Feadship-Bannenberg alliance was the radical restyling of windows and the innovative positioning of tenders. 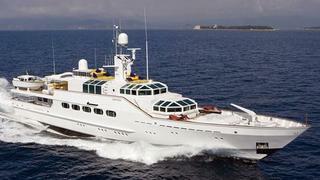 A trendsetting yacht in its design – for this was Jon Bannenberg’s Azteca – Lionwind was built by de Vries in 1983. Azteca together with sistership Paraiso, were commissioned by Mexican media tycoon Emilio Azcarraga and broke the mould of yacht design with their dramatically different design concepts, highly unorthodox layouts and innovations such as observation watchtowers. Blown away by Azteca when he went on board, Malcolm Forbes brought in Jon Bannenberg to design the fifth The Highlander (see above). 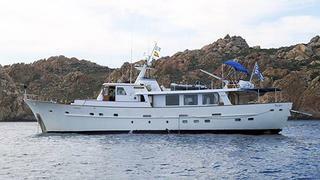 Lionwind is currently listed for sale with Bradford Marine Yacht Sales. If the story of Feadship is one of striving for perfection, then it is also one of inspiring absolute loyalty and devotion amongst its owners, and none more so than Jim Moran, owner of seven Feadships. 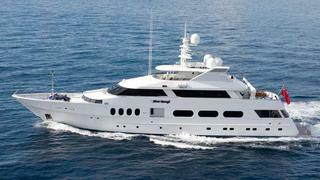 In his words: ‘There is nobody – and I mean nobody – who can build a boat with the quality of Feadship. It is the relentless pursuit of perfection that very few, if any, have been able to attain.’ All seven of his yachts were named Gallant Lady, and Jim Moran was involved in the design of each and every exterior. Never Enough left the Feadship yard as Gallant Lady IV, and was a substantially larger displacement vessel than Jim Moran’s previous yachts. He was, as ever, involved in its design – particularly the space allocation – and his wife Jan played a significant role in the yacht’s interior design. Its unprecedented technology included concealed tenders – which Moran felt spoilt the lines of the yacht – that were retrieved from their special hatches by raising the deck at the push of a button.